Whether you’re a seasoned advocate, a student, or a community member interested in learning more about domestic violence, our user-friendly resource library is a great tool for you. We have compiled an extensive database of publications, images, websites, webinars and more — all dedicated to understanding the dynamics of abuse, prevention strategies and community solutions. See our search options below. Results of your search will appear at bottom of screen. Don’t see what you’re looking for? Check back often as we’re frequently tagging and uploading additional materials. Or contact our Help Desk: info@cpedv.org. And if you would also like to search for additional materials compiled by our national partners, click on the links to the left (which will direct you to their searchable sites). During this session we provided an overview of the concepts learned during our in person strategic communications training. We also discussed steps that can be used to effectively engage school boards and school administrators in adolescent dating abuse prevention efforts. 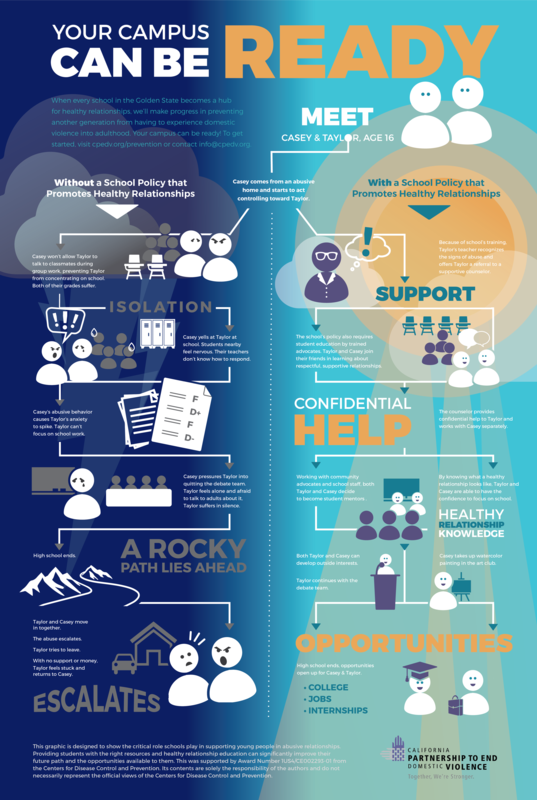 Our July PPN webinar is an introduction to the Partnership’s statewide Domestic Violence Awareness Month campaign! 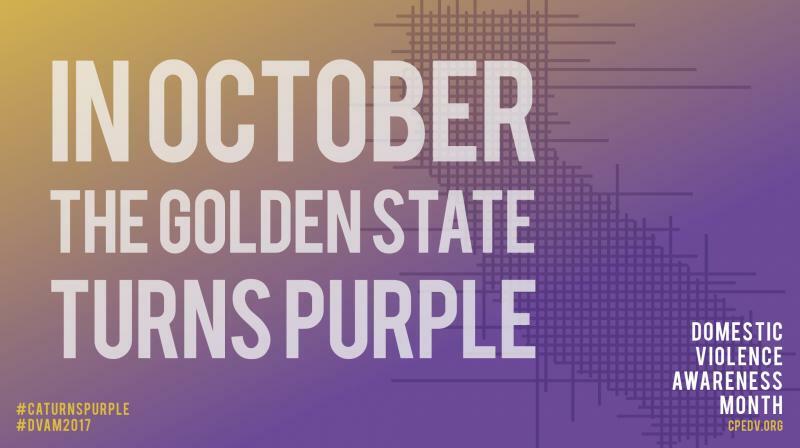 In October, the Golden State Turns Purple unites all Californians, from seasoned advocates to interested community members. Our calendar will provide you with daily activities and resources–including interactive Facebook chats, shareable images and videos. Our campaign is meant to initiate thoughtful conversations and mobilize action–from media and policy advocacy to letter writing to incarcerated survivors. “The Violence Against Women Act (VAWA) includes important protections for immigrant victims of domestic violence, sexual assault, dating violence and stalking. It is well known that abusers often use a victim’s lack of immigration status as a tactic of abuse – threatening to report them to ICE and have them deported. Similarly, it is extremely common for abusers to tell immigrant survivors that if they reach out for help from the police or the courts, then they will be arrested and separated from their families. “The federal Domestic Violence and Housing Technical Assistance Consortium (the Consortium) is an innovative, collaborative approach to providing training, technical assistance, and resource development at the critical intersection of domestic and sexual violence, homelessness, and housing. The Blue Skies Listening Tour was an opportunity for Partnership staff to truly listen to California communities, without imposing their own opinions or attempting to shape the conversations. The name Blue Skies Listening Tour was meant to offer an imaginary backdrop on which participants could develop ideas about how to more fully and effectively address domestic violence in their own communities. The blue sky was an invitation to innovate without restrictions—without the need to consider the expectations of governments, funders, traditions, history, or habit. Emergencies are inevitable; but by developing safety plans and procedures in advance, your organization can effectively identify and address impending hazards, as well as prepare effective measures to aid recovery after the event. The Partnership’s Emergency Preparedness Toolkit includes a compilation of trusted emergency preparedness resources and guidance materials. This webinar is a discussion on the Partnership’s recent primary prevention trainings. It includes the Strategic Communication’s Training series held in locations across the state and the Building Change Together Training held in Sacramento.